Burgess Hill Town boss Simon Wormull is going to Haringey Borough on Saturday looking to win - despite his side not scoring a goal for the last four league games. And Wormull could have Dan Beck and Aaaron Smith-Joseph could be back for the trip. The Hillians suffered a disappointing 3-0 home defeat to Bishop’s Stortford on Saturday which followed a 2-0 losses to AFC Hornchurch and Bognor Regis Town, and a goalless draw with Folkestone Invicta. But Wormull believes his side rise to the big games and thinks they can get something from the trip to Haringey - who are currently second in the Bostik Premier table, one point behind leaders Dorking Wanderers. The head coach said: “We are a funny team at the moment, we seem to rise to the occasions. For me it’s what team will turn up - this is the frustrating part for me. “I know I have a great group of lads. They are honest in terms of endeavour but you just don’t know what you are going to get from them week by week and that’s what we are trying to get to. And to be honest on Saturday, we will be going there looking to win. The Hillians shocked Haringey in October when they won 3-1 at the Green Elephants Stadium. Wormull said: “We beat them at our place and we beat them well - I think that started their 15-game unbeaten run. They have come into a bit of a lull as well which all teams have. “What we are finding is every game is difficult, if you are not fighting for the play- offs you are fighting for your lives at the bottom. 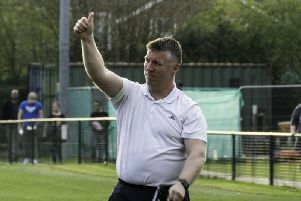 The Hillians then host Harlow Town on Tuesday night and Wormull is just happy not to have had a midweek game this week. He said: “It’s brilliant. It’s the first one we have had for five or six weeks. That’s the difficulty of it, you have so many games you sometimes don’t have time to put things right. If you are playing on a Saturday and Tuesday, Thursday is your recovery session and you can’t really work too hard. Wormull is hoping Dan Beck and Aaron Joseph-Smith will be back for Haringey. He said: “We are just trying to keep people fit. “We don’t have the resources to get two or three people in if we have injuries. We can’t do that. We have to go with the youngsters or shuffle the pack and play people out of position.